Coolness and silence surround the ancient village of Serenella located behind the Cinque Terre and to the feet of the path Casella - Vernazza. 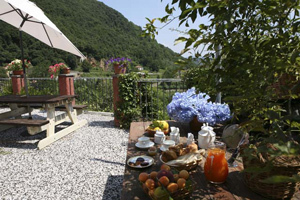 The renovated house is characterized by the surrounding outdoor areas equipped and panoramic. Features rooms with private bathroom and satellite TV. Clean and comfortable beds ensure a good night's rest. Nighttime reentry without limits of schedule after the delivery of the keys. On an outdoor area overlooking the valley, there are two large apartments with separate entrance, ideal for families or extended stays. The territory is crossed by streets and paths which are very requested by those who love walking, trekking and mountain bike tours. Close to our company there are tennis courts, football grounds, boccia fields and bow and arrow equipment; next to the river Vara there is a canoe school; within 15 minutes by car you will reach the public swimming pool of La Spezia; the zone of the Muzzerone is the perfect place for free climbers. Between sandstone, ceilings of wood, cotto floors, you will be able to relax, very close to the Park of the Cinque Terre. Free internet access (Wi-Fi) in the main hall. 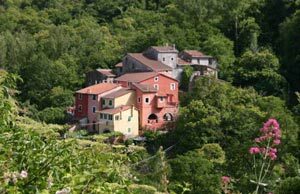 Cinque Terre : 30 minutes by car or 15 minutes from the rail station of La Spezia to turn them comfortably by train. Portovenere, Lerici: 30 minutes by car. Genova, Pisa : 60 minutes by car. Firenze: 90 minutes by car.